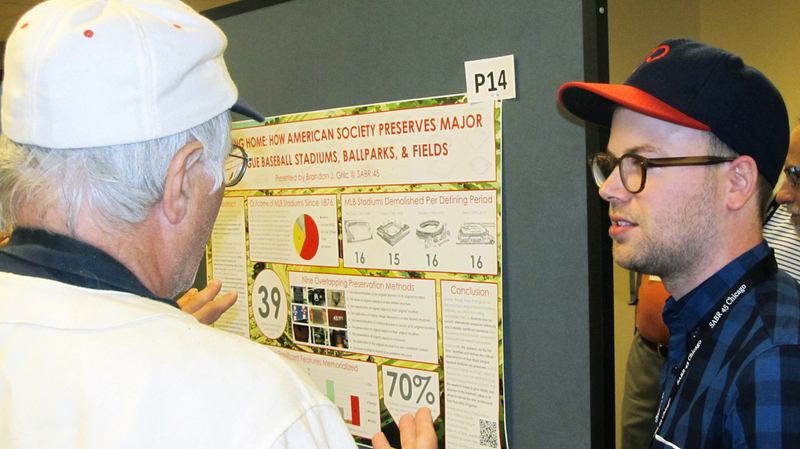 Chuck Hildebrandt has won the 2015 Doug Pappas Award for the best oral research presentation and Brandon Grilc has won the USA Today Sports Weekly Award for the best poster presentation at SABR 45 in Chicago. 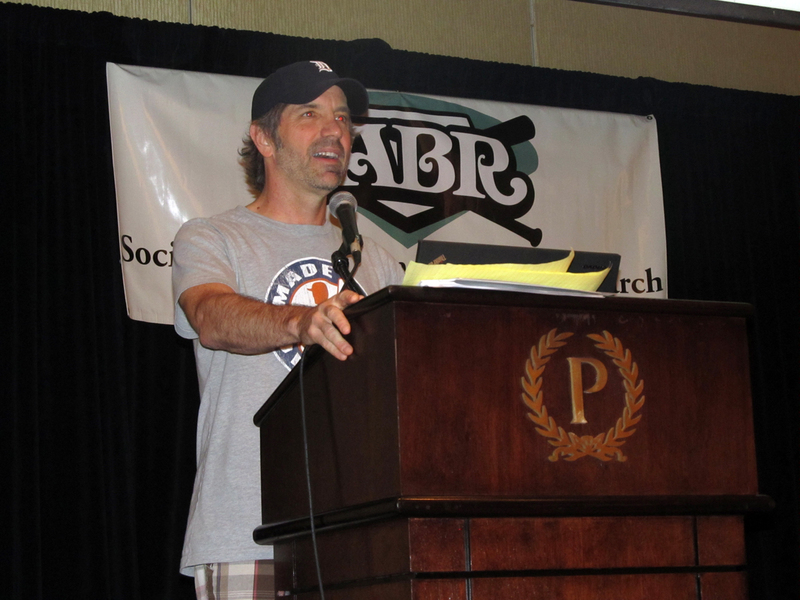 Hildebrandt, chair of SABR’s Baseball and the Media Committee and a SABR member since 1988, won the Pappas Award for his presentation, "'Little League Home Runs' in MLB History," which he delivered Saturday during SABR 45 at the Palmer House Hilton. The Doug Pappas Award — originally established as the USA Today Sports Weekly Award in 1992 and renamed in 2004 to honor the late baseball researcher — includes a $250 cash prize with a matching amount donated to SABR. 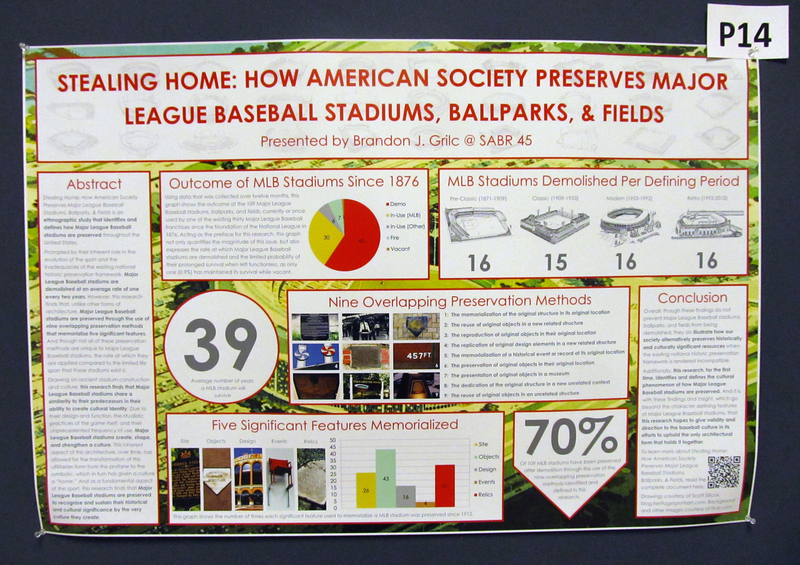 Grilc, a 2014 SABR Yoseloff Scholar and recent graduate from the University of Oregon’s Historic Preservation graduate program, won the USA Today Sports Weekly Award for his poster presentation, "Stealing Home: How American Society Preserves Major League Baseball Stadiums, Ballpark, & Fields." Ballparks are buildings. Each is different in terms of its relationship with its city, region, neighborhood, and social milieu. As they age and are replaced by more efficient, more modern facilities, a tension arises between preservation and demolition, between memorialization and dismissal. Grilc, a professional preservationist, identifies five ways in which a former MLB ballpark can be memorialized. Presenting examples observed during his studies of numerous former stadium sites, he considers the fate of the ol' ballyard when its useful life reaches its eventual end. The USA Today Sports Weekly Award — first presented in 1990 as the John W. Cox Award — includes a $125 cash prize with a matching donation to SABR. David W. Smith, "Home Team Scoring Advantage in the First Inning Largely Due To Time and Travel"
Dan Levitt, "Pat Gillick and His 'Many Rivers': One General Manager’s Approach to Gaining an Edge"
Heather O'Neill, "Boom and Bust: How Hitters Perform In Their Contract Year and the First Year after Signing a Long Term Contract"
This page was last updated June 22, 2016 at 11:06 pm MST.